Info Bret Baier is a Fox News political anchor and host of Special Report, the top-rated cable news program in its timeslot. Baier was born on 8/4/1970. He earned a B.A. in political science and English from DePauw University. He became a reporter, working for WRAL-TV (CBS 5) in Raleigh NC, then WREX-TV (NBC 13) in Rockford, IL and WJWJ-TV (PBS 2) in Beaufort, SC. Baier joined Fox News in 1998 as Southeastern correspondent in the Atlanta bureau. He then became a national security correspondent prior to being named Chief White House Correspondent in 2006. 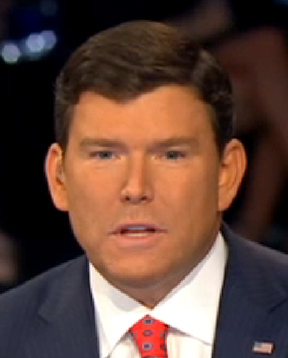 Baier served as co-anchor of Fox's America's Election HQ with Megyn Kelly for the elections of 2012 and 2014. During the presidential primary season of 2011- 2012, Baier moderated five presidential primary debates in addition to covering the primary and general election campaigns. He was a co-anchor of the First Republican Presidential Primary Debate of the 2015-2016 season and then the 7th primary debate later.